A pleasant walk from Little Berkhamsted village through fields and woodland over to Bayford village and back. 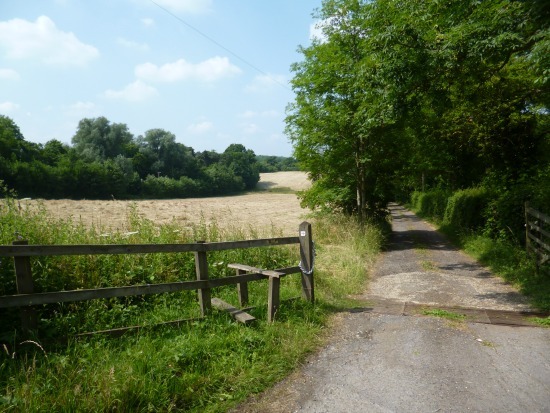 The walk includes open fields, shady woodland, footpaths, bridleways and has the benefit of a pub and village shop at the start/finish and a pub half way round. There are some parts of the route that go along lanes where, for a short distance, there is no footpath/pavement. Take the footpath to the east of the church (Little Berkhamsted footpath 9) and follow the path north-east until you come to a gate leading to Buck’s Alley. Turn right. Almost immediately you will see a stile and footpath sign to Bayford on the left. Take this footpath (Little Berkhamsted footpath 10) and continue heading east and north-east, crossing a field and dropping down to Bayford Woods. Walk east through the wood following the footpath south-east (Bayford footpath 5) as it climbs up to a field where you turn left and head north to a gate and stile in the hedgerow. Continue and follow the footpath to Ashendene Road. Turn left and follow this road into Bayford village taking care because there isn’t really a footpath/pavement to walk along. Keep walking through the village until you reach the Baker Arms - an opportunity for refreshments if you’ve picked the right time of day. Turn left down Well Row and follow the lane, watching out for traffic. Again, this is a lane without a footpath/pavement. When you reach Bayford church keep left along Bayford Lane. The road will swing to your right and, shortly after a cottage on your left you will see a footpath sign and stile leading left and heading west through a gap between the house and the hedge (Bayford footpath 4). Continue along this path and cut through a field with horse paddocks left and right. Your way is straight. Continue with the field on your left. Just after the point where the path turns to the right and heads north-west you will see a footpath on your left. Take this path that cuts through the crops heading due south-west and down hill to Bayford Woods (Bayford footpath 3). 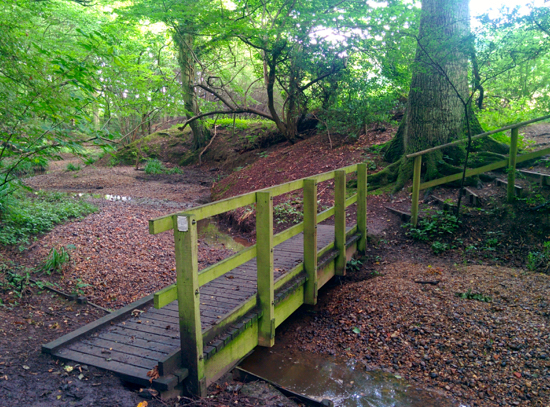 Go through the woods, dropping down to the stream, which you cross via a footbridge. Climb up to the field and turn left following the footpath (Little Berkhamsted footpath 6) keeping the hedgerow on your left and the field on your right. Go through a gap in the hedge and turn right keeping the field on your left and the hedge to your right and head west. Continue until you reach a small gravel track where you turn left. Follow this track as it goes south-west. Look out for a track on the right with a bridleway sign (Little Berkhamsted bridleway 21). Take this bridleway and head north following Stockings Lane. 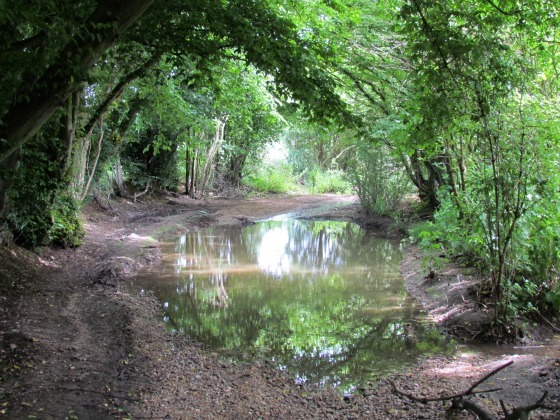 You will reach a bridelway junction, you take the left fork and head north-west along the bridleway (Little Berkhamsted bridleway 20) until you reach the end. 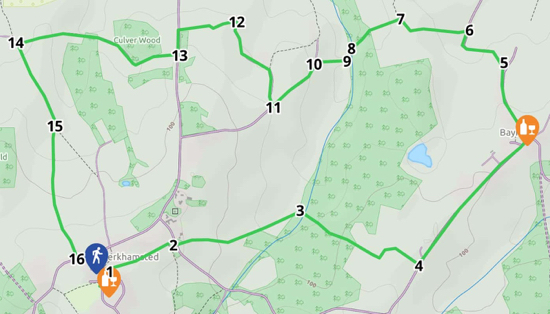 At this point look out for a footpath on your left (Little Berkhamsted footpath 5) which heads west and eventually leads to Robins Nest Hill where you turn left. Continue along Robins Nest Hill a short distance, and, after a cottage on your right, take the track on your right (Little Berkhamsted footpath 5) keeping Culver Wood on your right. Follow this footpath as it weaves first right then left past cottages on your right and ending in a gate and stile. Cross the stile and climb the hill and continue heading west over and down to the bridleway on the far side. Turn left on the bridleway (Little Berkhamsted bridleway 18) and follow it south over a footbridge. Just beyond the footbridge take the right fork and continue heading south up the hill keeping the field on your left and the hedgerow on the right until you emerge on Little Berkhamsted Lane. Here you turn left and, at the next junction turn right to return to your starting point. Refreshments can be taken at The Five Horseshoes, and snacks can be bought at the village store - subject to opening times.